Purportedly, this was Paul Gossen's first meter, the one on which he built his company. (They're still in business.) If their date of 1933 is correct, it's one of the earliest photo-electrics made (along with the Weston 617 and Rhamstine Electrophot). Gossen revised it in 1936 by adding a little calculator dial and called it the Ombrux 2. A couple years later that morphed into the Sixtus. My version is a Blendux, and case is stamped "J.H. Dallmeyer, London" inside, which was a British optical company; I assume they imported it and sold it through their channels. Unlike the contemporary Westons, General Electrics, etc, this one is not calibrated in foot-candles. It's set up to direct-read (sort-of) for movie work. 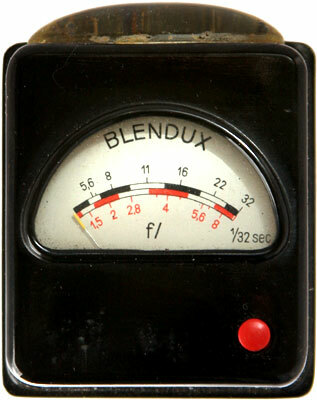 The Ombrux and Blendux are the same meter, but the Ombrux was for still photography and the Blendux was the cine version. So at a shutter speed of 1/32 you can direct-read the ƒ/stop on the meter face, using normal speed film. For "faster" films and different frame rates, you can consult their tables (printed on slim metal plates and kept inside the leather case with the meter itself). Since this meter came out before widely accepted film speeds, you have to look up the name of your film stock on an index to find out which table to use. This one has two really novel features you don't see on contemporary meters. the first is that big, eliptical lens on top that sits over the cell. That disappeared quickly. The other is the red button down in the lower right-hand corner. There are two scales on the meter face: black above the line and red below it. If you meter in bright light, you use the top scale. If the light isn't bright enough to register, you press the red button and read the bottom scale. The Weston 617 did something similar, but GE had to make due with masks, DeJur and later Westons (like the Master) used mechanical gates to cut the light levels. Thank you to Anssi Puisto for clearing up the Ombrux/Blendux nomenclature. If you like Gossen meters, check out this Gossen Collection site. and are not affiliated with this website in any way.